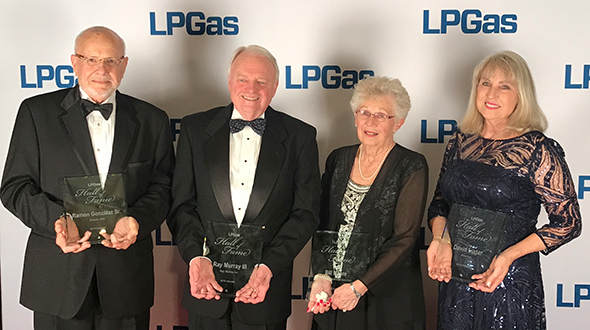 The LP Gas Hall of Fame inducted its eighth class at The Ritz-Carlton Atlanta, adding four more propane industry professionals to its ranks. 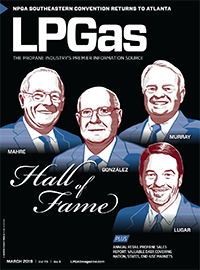 David Lugar of AmeriGas, Ray Murray III of Ray Murray Inc., Bill Mahre of Propane Technical Services and Ramon González Sr. of Empire Gas represent the newest class enshrined in the LP Gas Hall of Fame. The Hall now has 40 members since LP Gas launched the annual honor in 2012, the industry’s centennial year. LP Gas Publisher Brian Kanaba and Editor-in-Chief Brian Richesson served as the masters of ceremonies. Murray and González Sr. were on hand in Atlanta to accept the honor and offer perspective on their illustrious careers. Lugar and Mahre were both inducted posthumously. Lugar was represented by his wife Lajan and daughter Kellise McLaurin. Mahre was represented on stage by his wife Jeri and daughter Bonnie Hagen. 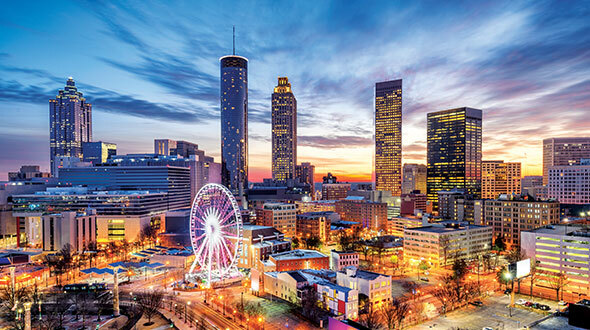 About 120 friends, family members and fellow propane industry professionals attended the induction ceremony ahead of the 2019 National Propane Gas Association Southeastern Convention & International Propane Expo. Nominations are now open for the 2020 class and can be made at lpgashalloffame.com. Ramon González Sr., 86, helped set the stage for the LP gas industry in Puerto Rico as it is known today. González has been a dynamic, gifted salesman for Empire Gas and the industry. His determination to innovate and move forward started at an early age. After graduating from the University of Puerto Rico, González started working his first job at Esso Gas, promoting the use of LP gas door to door. Back then, he had to show potential clients the basic tests of the stove and how to cook. He spent 13 years at Esso Gas, where he held a top executive position. With his charismatic and visionary attitude, González built the foundation of Empire Gas in his garage in 1967 with his wife, Ketty Simounet Bey. By 1985, all four of his children had joined the company, which at the time was selling 14 million gallons of LP gas a year. Today, Empire Gas sells about 75 million gallons annually with 50 bulk plants, three port terminals, 1,000 points of sale promoting LP gas from 20-pound cylinders to 30,000-gallon tank installations throughout Puerto Rico and the neighboring U.S. and British Virgin Islands. In the aftermath of Hurricane Maria in 2017, Empire Gas maintained propane supply on the island – and power, in some cases. It designs and offers propane-fueled combined heat and power systems for customers. 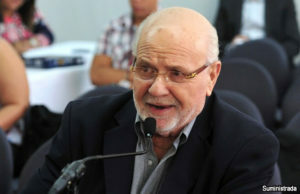 One of González’s most notable accomplishments is creating a department of cogeneration, under his son Ramon González Jr.’s leadership, for industrial sites in Puerto Rico, including pharmaceuticals. David Lugar’s contributions to the propane industry, through his time with Conoco Inc., AmeriGas Propane, NPGA and the Propane Education & Research Council (PERC), were many. In everything he did, Lugar let his faith and respectful personality shine. He was an active member of NPGA, serving on the board of directors as a supplier member while employed by Conoco and later as a marketer member with AmeriGas. 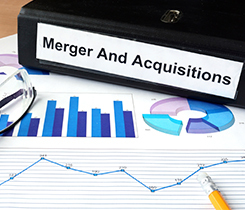 Prior to his 15-plus years with AmeriGas, where he served as vice president of supply and logistics, Lugar worked for Conoco Inc. for 21 years in various commercial and management positions in the natural gas and gas products department. Lugar served as NPGA’s chairman of the board from 2014-15. He was also a charter member of PERC, which formed in 1996, and served in various officer positions on the council, including two terms as PERC chairman in 2003-05. Lugar led at critical times for the industry, such as when he chaired PERC during the Certified Employee Training Program transition from NPGA and years later led NPGA following a supply disruption during the prior winter, building tools to avoid a recurrence. 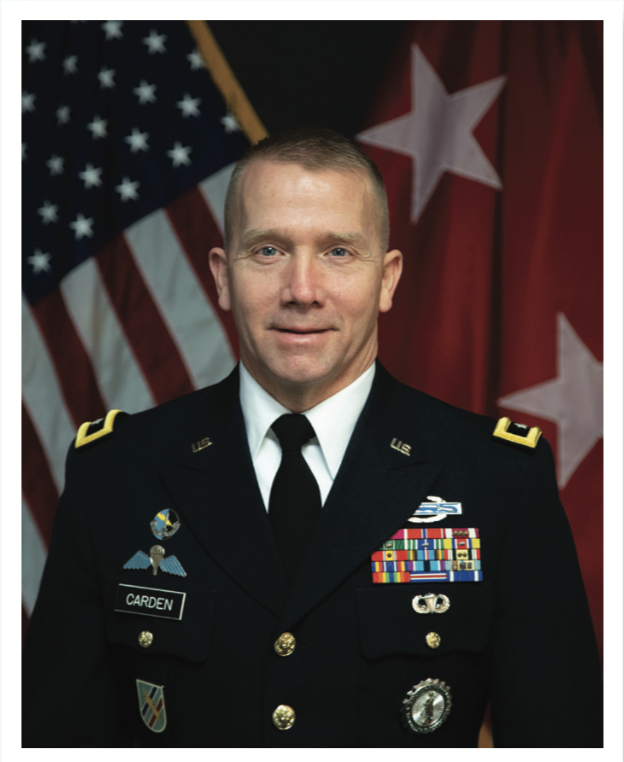 He is a recipient of NPGA’s 2016 Distinguished Service Award. NPGA also announced the formation of the AmeriGas David Lugar Memorial Scholarship. Lugar, who was born in Oklahoma and resided in Texas, died in 2016 at the age of 59. Minnesota native Bill Mahre was a long-time safety advocate in the propane industry, serving as a mentor, educator and safety leader to many. 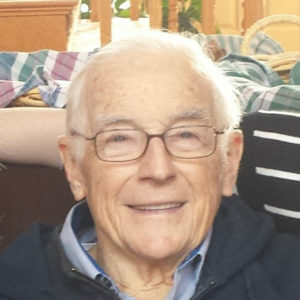 He served in many capacities of the industry during a 65-year career, which started at St. Paul Bottle Gas Co. (Home Gas). He also volunteered his time and expertise to the NPGA, the National Fire Protection Association (NFPA) and the Minnesota Propane Association (MPA). 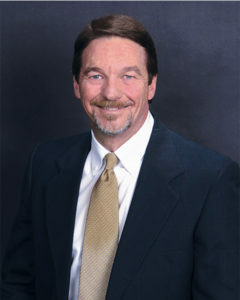 He served on and chaired the NPGA Safety Committee. He was also a long-time member of the NPGA Technology, Standards and Safety Committee and an NPGA liaison member of the NFPA 58 Committee. 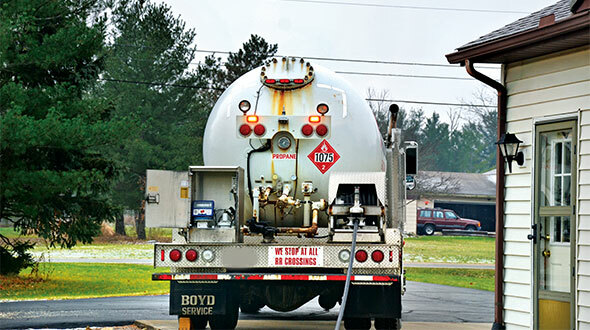 As owner of Propane Technical Services, Mahre investigated propane accidents, served as an expert witness in legal cases, provided consulting services on propane equipment installations and instructed industry employees on various issues. He was also affiliated with the International Association of Arson Investigators. Mahre won several presidents recognition and distinguished service awards during his career. He was awarded lifetime membership into the MPA for his selfless giving to the industry in Minnesota and nationally. Mahre died in 2015 at the age of 80. Honorable, sincere, affable and helpful. Ray Murray III has embodied these characteristics and more throughout his 40-plus years in the propane industry. The Massachusetts native has shown the ability to lead the industry and, when called upon, is always willing to lend a hand to industry members. 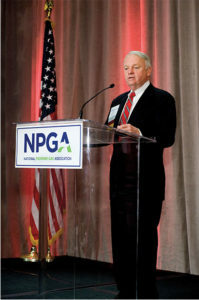 As NPGA chairman in 2012-13, Murray played a large part in its Vision 2014 strategic initiative, which sought to put the industry back on a path to growth after years of decline. Murray pushed this agenda and oversaw the association’s process of trying to determine the direction to take the membership – scale back its activity or carry out that growth strategy. “We can’t do the same things every day and expect a different result,” Murray said at the time. “We’re trying to break the cycle [of decline].” Except for a four-year stint in the Army and four years with Aetna Life and Casualty as a regional pension supervisor, Murray has spent his entire career working in the family business, which his father started in 1973 as a distributor of propane gas equipment and appliances. Murray eventually became a partner/owner with his brothers, Jim and John. He’s now semi-retired, serving as chairman emeritus and an adviser to the company and working part time on association activities. Murray, 72, resides in Great Barrington, Massachusetts, with his wife, Holly. They have a son and daughter, and five grandsons. 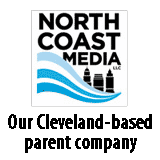 Ray Murray III, Ray Murray Inc.